In the most recent episode, fan favorite character and Season 1 veteran Glenn Rhee was left in a precarious situation: falling headfirst into a sea of walkers. As if that wasn’t bad enough, the scene ends with walkers devouring some fresh, bloody entrails. Things don’t look good for Glenn, but it’s far from certain that he’s dead; for one, Glenn’s mortal-enemy-turned-friend Nicholas fell on top of him, so the walkers could be munching on his intestines; for two, Glenn was left out of The Talking Dead’s “In Memoriam” segment; and for three, Glenn’s death occurred far from the end of the episode. If a death as high-profile as Glenn’s was going to happen, it’d take place at the end of the episode and it would be a moment all on its own, not a moment shared with Nicholas’ death, and not a moment that is going to get swallowed up by fifteen more minutes of airtime. Glenn’s gotten himself out of precarious situations before, and while I don’t know how the writers are going to save him from this fate, I remain certain that Glenn is dead. 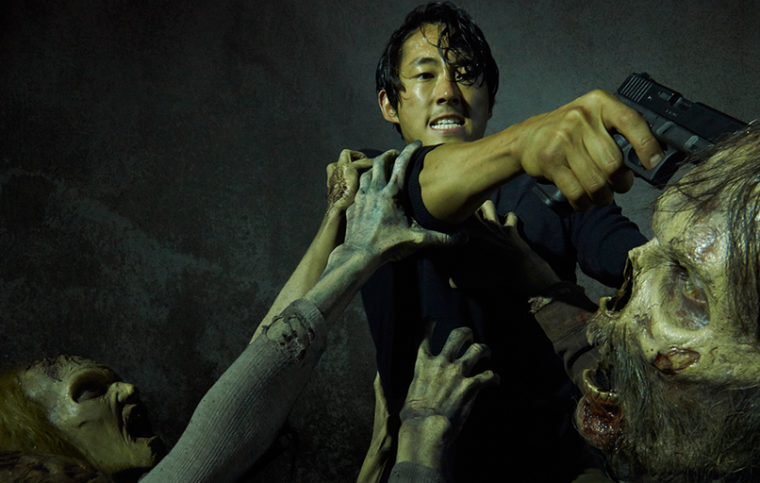 That being said… Glenn is still in danger this season. In the comic books, he dies in a very notable way close to this point in the storyline – but we’ll talk more about that later. Another piece of evidence for Glenn’s survival is that he had an amazingly memorable, unforgettable, iconic death – something that a simple devouring by a group of walkers doesn’t do justice to. As this moment rapidly approaches, Glenn continues to be in more and more danger, but that’s not to say that his death is certain – the writers have been known to change things around from the comics, such as having Sophia (who is still alive in the comics) die before her mother Carol (who, in the comics, died at the prison). If the writers change things up again – and who’s to say they won’t, with Glenn being such a widely popular and beloved character; this show is about keeping viewers and making money, and while there would be a lot of shock if Glenn died which would be effective for the show, the producers would be smart to keep him safe – then it could be someone else taking his fate. In the comics, it was Dale who was kidnapped by cannibals and had his leg amputated for food; last season, Bob fell into that role. The writers love shaking things up so when the infamous scenario arrives, and we all be lieve Glenn is about to be murdered, they’ll fake us out and kill someone else instead – someone like Glenn’s wife, Maggie. It’s already been hinted to us that Maggie is pregnant like she was in the comics, and after Glenn’s death she promises to raise their child in a better world; it would be a complete storyline fake-out for the writers to then kill Maggie off instead, leading to different, more dramatic storylines. It’s all speculation at this point but this is something I would make sure to keep on your radar. That better world Maggie raises her child in in the comics is the Hilltop, another safe community like Alexandria. We move closer and closer to the Hilltop because, aside from simple storyline progression, the most famous Hilltop resident – Paul “Jesus” Monroe – has been cast. 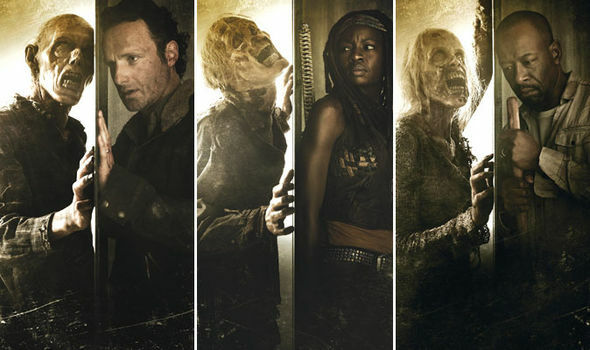 As The Walking Dead, these days, splits it’s seasons into two distinctive parts, it would narratively fit for this first half of the season to continue on its projected path (which we’ll discuss later), possibly introduce Jesus during the mid-season finale, and focus on the relationships between Alexandria and Hilltop during the latter half of Season 6. As readers of the comic book know, we’re coming close to a clash between four powerful groups: Alexandria, Hilltop, the Kingdom, and the Saviors. Executive producers have already hinted their interest in casting Ezekiel, the Kingdom’s leader, and his tiger Shiva, and the big bad leader of the Saviors, as we’ll discuss next, might be coming sooner than you think. All we know for certain at this point is that Hilltop’s recruiter Jesus is coming to our screens sometime during the season, and we should expect him to bring his community with him. If you know who he is, you’re getting chills. If you don’t, you’re about to. Negan is the savage, charismatic, destructive, powerful, insane leader of the Saviors, a group that is basically a functioning apocalypse cult under his control. This man is truly the big bad of The Walking Dead, and he makes The Governor look like a scared little puppy. This is the guy who comes on to the scene in Issue #100 and brutally, randomly selects Glenn for execution, bashing and destroying his head with a baseball bat adorned with barbed wire, while Glenn calls out his wife’s name over and over. This is the guy who comes up with the idea to cover ordinary weapons in walker germs in an attempt to convert anyone who survives their attack. Negan is huge and he means big things for what’s coming up – and he is definitely coming up. 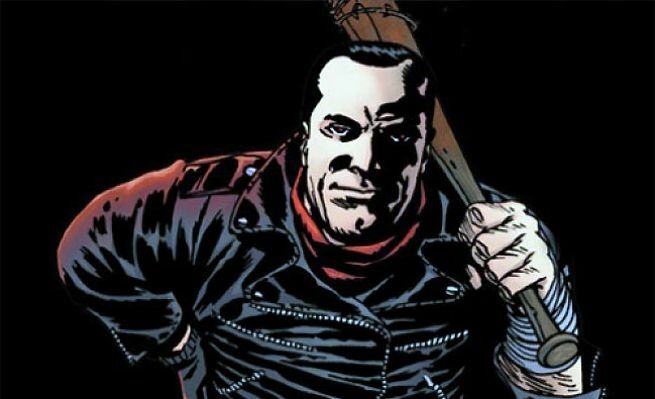 A recent casting call for the character of “Orin” was sent out that is very obviously Negan. They’re definitely not throwing Negan in for a recurring role during the season, but if I were a betting man, I’d wager we see Negan make some kind of appearance in the season finale. Hilltop is coming, and Negan really enters into the fray because of Hilltop. His Saviors had made a deal with Hilltop at some point that the Saviors would pick off the walkers that approach the community with guns that the Hilltop residents didn’t have, and would take half of Hilltop’s supplies in exchange. Leader Gregory does what he can to please Negan, making deals to sell out his people in exchange for protecting his life. It’s easy to imagine Jesus bringing Rick and company onto the scene, Rick recognizing Gregory as an unfit, destructive leader, bringing a swift end to his reign, and then Negan casually strolling up and saying something along the lines of, “That was a dumb ******* thing to do.” (Negan has a twisted sense of humor and a propensity for cursing on top of everything, which is most likely going to push network censors to their limits.) Negan is coming this season in some shape or form, most likely as a result of Alexandrian influence in Hilltop, and it’s going to be horrifyingly beautiful. Spoiler alert – at this point in the comics, Alexandria gets pilfered by the Scavengers, tries to recover, and then gets razed again by a huge horde of walkers. We’re definitely on that track – this season’s villains so far, the Wolves, are a heavily modified version of said Scavengers, and we’ve had a huge horde of walkers since the beginning. What’s going to happen? Well, Alexandria was already assaulted once by the Wolves, so there’s that part of the storyline, but I doubt that we’ve seen the last of them to this point. The Wolves Leader is still alive, having been captured by Morgan in “JSS”, and I bet his followers are going to want him back. Either Alexandria will be attacked by the Wolves again, and after all the carnage, the horde will advance on the community, or another attack will happen, during which the horde will arrive. Either way, expect another Wolves attack and a huge walker assault on Alexandria before the season is finished. With something like that, there’s obviously going to be casualties, and let’s take a look at who probably won’t be exiting the season alive. In the comic books, both Jessie and Deanna’s counterpart, Douglas, die during this time; I think we can expect Deanna to certainly die before things have come to pass, but Jessie will probably be sticking around for longer, due to the multi-season contract Alexandra Breckenridge has signed. Carl also notably loses an eye soon; this might not happen, as Rick was slated to lose one of his hands at the prison, but the writers strayed off of that course. That being said, losing an eye is a much different creative option than losing a hand. Having to film with the series’ main star forced to use a fake hand instead of his real one would probably prove very problematic, but throwing an eye patch over someone isn’t too much of a hassle. Some characters have more interpretable fates – namely, Carol, Daryl, Sasha, and Tara, who either didn’t exist in the comics or were already dead at this point. Carol has become an amazing lead for the series, going through spades of character development since her debut and becoming quite frankly the series’ badass; her death would unquestionably shock, but I think she, like Glenn, is probably safe for the time being due to how massively popular her portrayal is. Daryl, potentially the series’ biggest fan favorite, is most likely safe for similar reasons, with the rally cry of “If Daryl dies, we riot” being prevalent for years. Tara is probably the most at-risk of the main cast; not only does she not have connections from the comic series, she is also the least connected to the main characters, and thus the most expendable. If Tara dies, it’ll be shocking and dramatic, but it’s a death the fanbase would more easily accept than Glenn’s or Carol’s, which makes it more likely – when you’re expendable, you’re at risk. Sasha is another character who is at risk because while she has also had an incredible developmental growth – my personal favorite story arc out of any character, as Sasha has lost all hope in this world, being let down and watching her close loved ones die time and again – she has recently been promoted to star billing, which does not bode well for her. The Walking Dead has had a recent tradition of killing off characters who were formerly given “also starring” billing before their promotion; Hershel, “also starring” in Season 3 and starring in Season 4, was killed that season. The same could be said of Beth Greene, Hershel’s daughter, and Tyreese, Sasha’s brother, moving from Season 4 to Season 5. Sasha is in trouble, but she’s got more to offer than Tara, which might keep her around a little longer. To round out, I’ll talk a bit about the main cast. I thought they should’ve killed Rick off last season, as it would’ve blown everyone’s minds out, and the series is more than capable of sustaining itself without him; that being said, he and Carl are most likely safe with Carol and Daryl, and we should expect Glenn to survive his recent ordeal, but keep looking at him for the rest of the season. Maggie is in trouble if Glenn lives; they’ll kill one of them but will not kill both, as it will be compelling television to watch the surviving one struggle through life without their spouse. Michonne won’t die anytime soon – she’s too important. Sasha and Tara are both on the bubble, Sasha because she’s suddenly becoming a more central character, Tara because she’s been more of a supporting character and is thus expendable. While hugely popular, Abraham isn’t going to live forever, but his death won’t be coming this season; he will be a casualty of war with the Saviors. Rosita and Eugene are mildly expendable characters, so if someone needs to die, they could be in trouble; that being said, they have relatively long life spans in the comic, so I feel comfortable expecting them to at least make it out of this season alive. Gabriel has a redemptive arc coming this season that gives him a 50/50 odds of survival; still alive in the comics, you could keep Gabriel around to develop him more like his counterpart, but it would be a perfectly tragic storyline to have Gabriel try to become a hero and then die protecting someone else. Neither Aaron, Jessie, or Morgan – especially Morgan – are going anywhere any time soon. Deanna is all but certain to die this season, and while Spencer will die before long, I expect it to come in Season 7 – in the books, Negan kills him for his cowardice, and I don’t see any reason for the writers to change that little fun character quirk of Negan’s. The Walking Dead is an amazing series, and there’s a lot of great things coming for the fans soon. The series airs Sundays at 9PM EST on AMC.